Two consecutive songs of the week I feel alive. 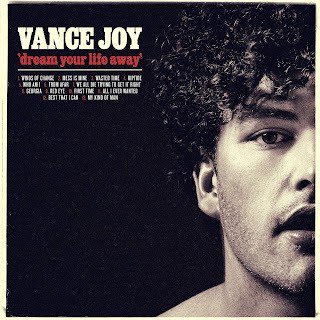 This week I have been listening to Vance Joy even more than I usually do. And I've come to the conclusion that Red Eye really is my favourite of his songs. It is beautiful. And I've been on a bunch of trains/long car journeys this past week, and even more in the past month, and this has always been the song I've wanted to listen to. The term 'red eye' refers to a flight that leaves late at night and arrives early the following morning, and oh how I long to listen to this song on one of those flights. I just think it would create this atmosphere that you wouldn't feel at any other time. Like, I think it's a great song for any kind of travel, but the idea of listening to it during a night flight just sounds ideal, like watching the sun rise to this song. Wow. It's going on the bucket list. It is the most stunning, calming song. It sounds so gentle and sleepy, but with this longing to stay awake. It sounds like everything it's describing. I can't really get over how perfect it is. There's normally like one tiny thing I won't be so crazy about in a song, but I cannot fault a single second of this. I can't recommend listening to it enough, because I feel like you need to. I think it probably sounds really extreme to say that it's changed my life, but I'm pretty sure it has.